Your eyes are not playing tricks on you. That does in fact say Fudge Stuffed Oreos. Like Oreos on steroids. 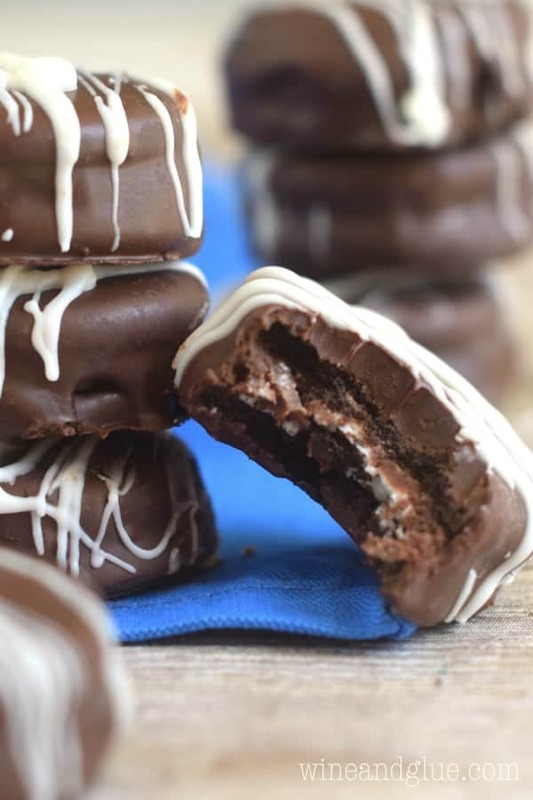 These amazingly delicious little cookies are so crazy good you won’t ever want to eat Oreos without that layer of fudge! The other day I asked my FaceBook friends what their favorite type of Oreos is. You know, like a friendly ice breaker question so I can get to know the depths of your soul. Important stuff, people. 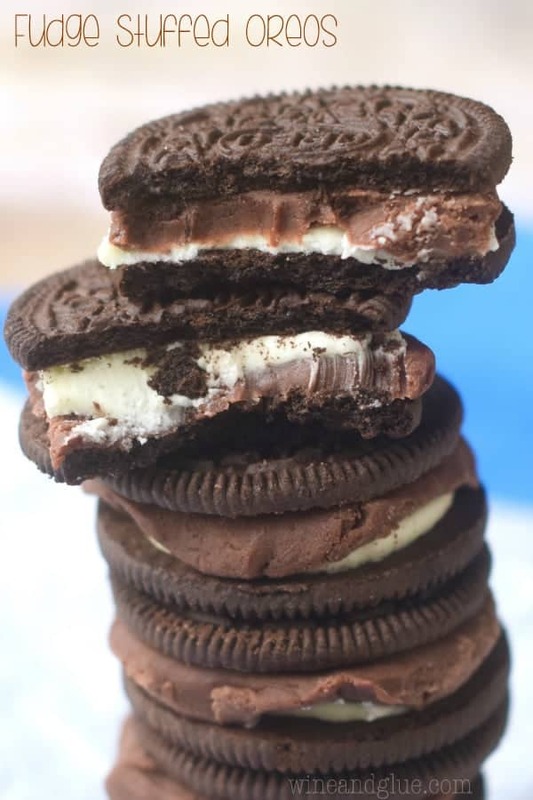 Well, one of my FaceBook friend chimes in that her favorite type of Oreo is the kind that she takes apart and STUFFS fudge in! I screech to a stop just like the road runner and literally feel the world stop spinning on it’s axis. Of all the amazing chocolatey genius ideas, holy hell, why did I not think of this sooner??? And because the odds were in my favor on this gloriously fudgey day, I just happened to have a fresh batch of fudge laying around for no real purpose other than to have their photographs updated and be stuffed between two cookies in what can only be called an Oreo Cookie Glory Sandwich. So you start with some fudge that has been sitting out of the fridge. Now. Typically after I make fudge, I cool it in the refrigerator because it makes it really easy to cut into nice perfect pieces and then I store it out of the fridge in an airtight container. But on this perfectly fudgey day, I just happened to have non-refrigerated fudge that was soft, malleable, and begging to be stuffed in cookies. You take the edge pieces that are kind of curved from the pan and you use those to break into little pieces and make them into thin patties with your hands and stick them in your Oreos. Ooooooor, you can go ahead and dip them in chocolate to seal all that fudgey goodness inside and then drizzle it with white chocolate to make it fancy enough to give as a gift or remind yourself that they are a decadent treat and shouldn’t be popped in your mouth like tic tacs. I’m pretty sure I owe that FaceBook friend a commission on this post . 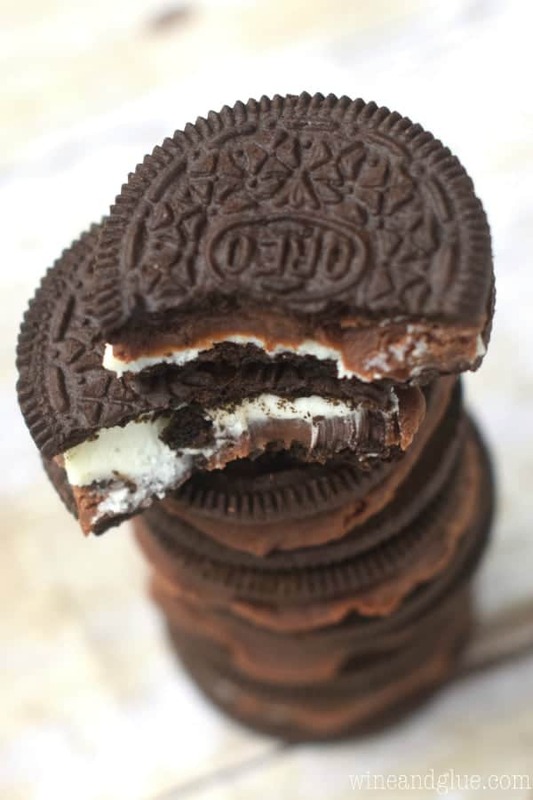 . .
Open up the Oreos and add pieces of fudge to it. Put them back into sandwiches. Melt the semi sweet chocolate chips according to the package instructions. 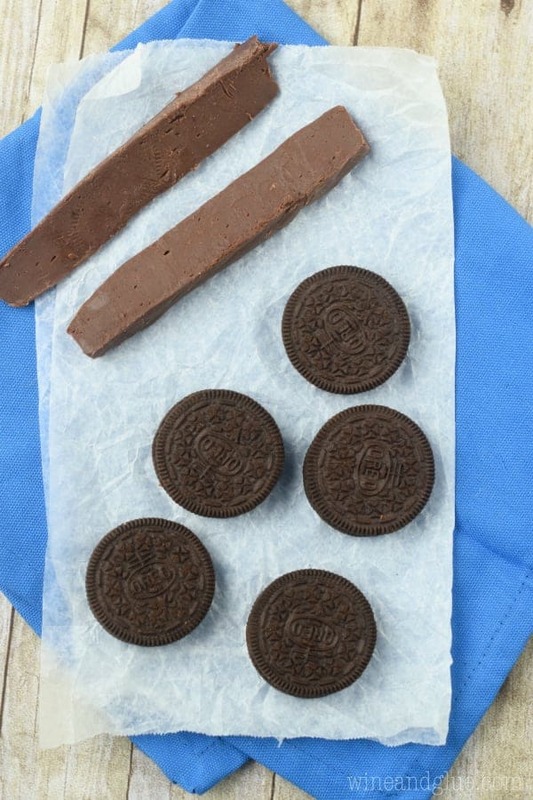 Using a fork, dip the Oreos into the chocolate and tap off the excess chocolate. Transfer to wax paper and allow them to dry completely. 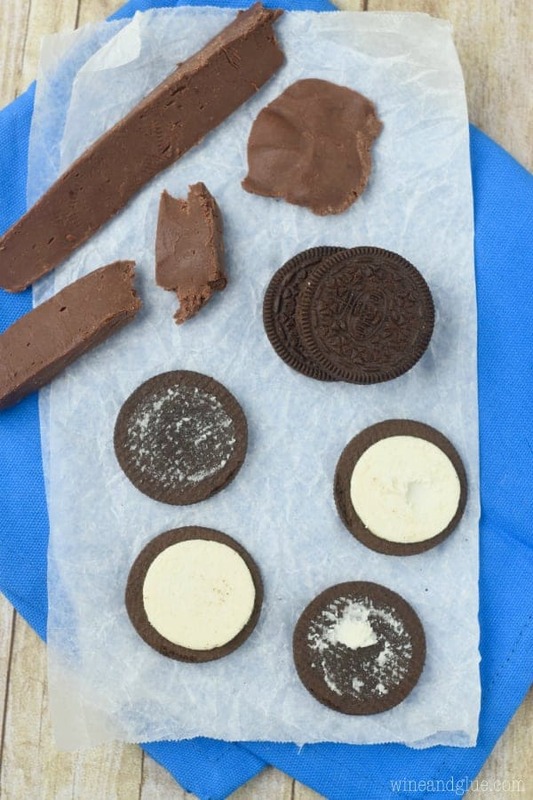 Melt the white chocolate according to package instructions and drizzle it over the Oreos. Let dry completely, store in an air tight container. My son loves the birthday cake flavor. He INHALES them. I’m more into the Reese’s flavor. But honestly, an Oreo is an Oreo. As in, crack. Awesome crack. These look so dang good. 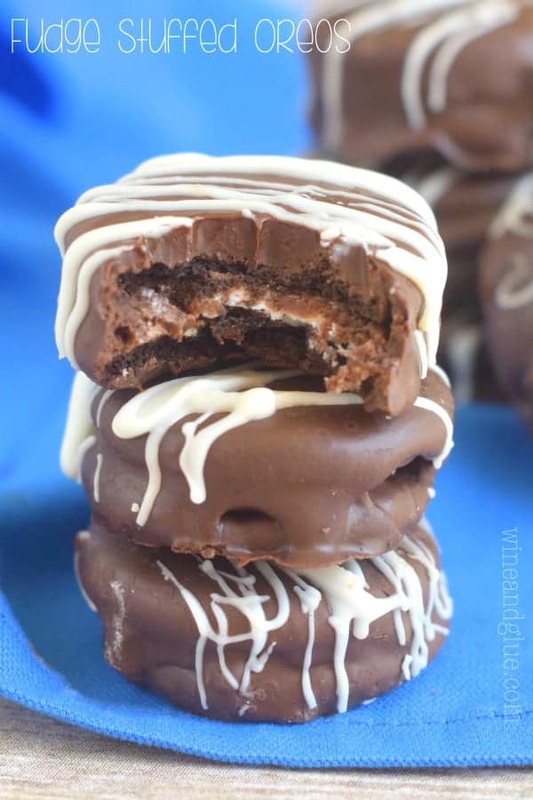 I’m a huge fudge fan, and adding Oreos into the mix is just inspired! Oh my, these cookies look amazing! I don’t think I could be trusted to have these in my cupboard! You and me both Julie! This is EPIC. Life-changing. The best thing I’ve seen in months. SERIOUSLY. Thanks Dorothy! Since you are so good at reading all.the.blogs. that’s a serious compliment! I’m thinking about maybe using peanut butter fudge in place of chocolate fudge or stuffing with Reese’s peanut butter cup; slightly flattened or maybe using a York patty. Pretty sure these will be on the buffet table in heaven. Not stupid at all Patsy! If you click on the hyperlink for fudge within the recipe it will give you a SUPER easy recipe for fudge. It’s a little spicy (and delicious!) so if that doesn’t sound like your thing, just leave out the cinnamon and cayenne. Not silly at all Tami! There is a link to the fudge recipe that I used, and it’s SUPER easy to make, in the recipe!